We are a distinguished manufacturer's representatives/Distributors of Power Supplies. The items offered by us are manufactured in compliance with industry standards and find application in the communications and aerospace sectors. DIN Rail modules for DC/DC, AC/DC power supply and for LED Drivers. One of the most important foundations for the long time development of our company is the highest quality standard. 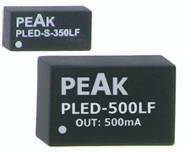 P E A K electronics GmbH offers a wide range of DC/DC-converters. More than 14.000 standard types are available. In addition to our standard types we can also offer custom designed DC / DC -Converters to our customers. The very high efficiency (83~93%) is the determining feature of these new dc/dc switching regulators. DC/DC Step Down Converter. Wide Input Voltage Range. High Efficiency. Cases DIP24 , D!P16 and DIP14. Remote Control Function: PWM / Analogue Voltage Control. Dimming Function: I out from 300mA up to 1200mA. Also as a "DIN Rail Version". Isolation Voltage 1500 VDC Input to Output (basic insulation), 1000 VDC Input to Ground, 500 VDC Output to Ground. Signals Combined input & DC OK - Open collector referenced to output 0 V, transistor normally off when input & output good. Input fail provides ≥5 ms warning of loss of output from input failure. DC OK provides warning of DC output failure. Extended Operating Temperature Range -40 to 85°C max. Signals Combined PF & DC OK - open collector referenced to output 0 V, transistor normally off when AC & output good. PF provides ≥5 ms warning of loss of output from AC failure.